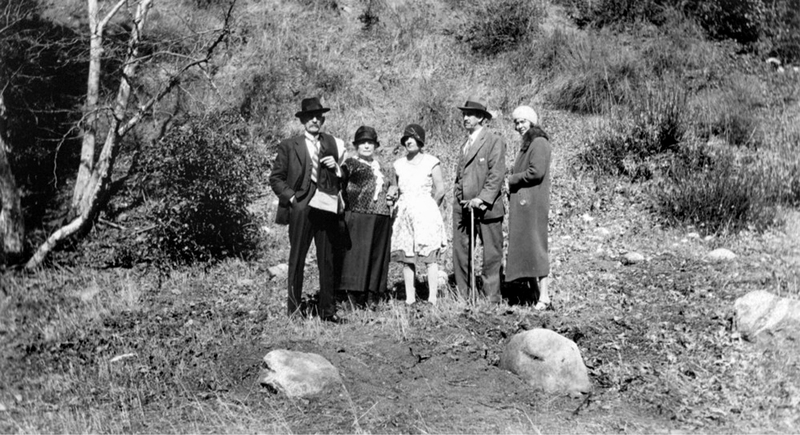 Dedication ceremony near the Oak of the Golden Dream in 1930, when the tree in Placerita Canyon State Park officially became "the" place where Francisco Lopez discovered gold on March 9, 1842. Hortense Walker (Oct. 11, 1885 - Apr. 13, 1931) is in the middle. Frances Lopez de Belderrain is second from left. Adolfo Rivera, master of ceremonies at the 1930 dedication, is second from right. The identity of the Oak of the Golden Dream in Placerita Canyon State Park as "the" tree where Francisco Lopez napped and dreamed of finding gold (which he did) in 1842 was not set in stone — literally or figuratively — until nearly a century later, in 1930, by Frances Lopez de Belderrain, a Lopez descendant. Belderrain (alternately Francisca Lopez de Balderain) had learned the story from Catalina Lopez, who was in her 80s when she shared the information with family members from memory. According to Adolfo G. Rivera, who presided at the 1930 dedication of the tree, Catalina would have been 12 years old when she attended an 1843 ceremony marking the one-year anniversary of the Lopez discovery, whereupon she learned learned the relevant locations. In a promotional brochure published by 1930s Placerita landowner Frank Walker, Rivera writes in part: "The first anniversary [in 1843] of this gold discovery was celebrated by the erection of a chapel on the site of the discovery and the chanting of a solemn high mass by three priests, two from San Fernando and one from Los Angeles, six altar boys, the entire Mission choir, consisting of twenty neophytes and eight musicians. Many prominent families of Los Angeles, Santa Barbara, San Buena Ventura and the surrounding country and the Commissioners sent by Mexico to investigate the truth or falsity of the discovery, were present, — a date in the history of our State was solemnized, which was to be forever after forgotten. "Catarina [sic] Lopez, wife of Geronimo Lopez, was eleven years old when gold was discovered here and was present at the celebration of the mass in 1843. 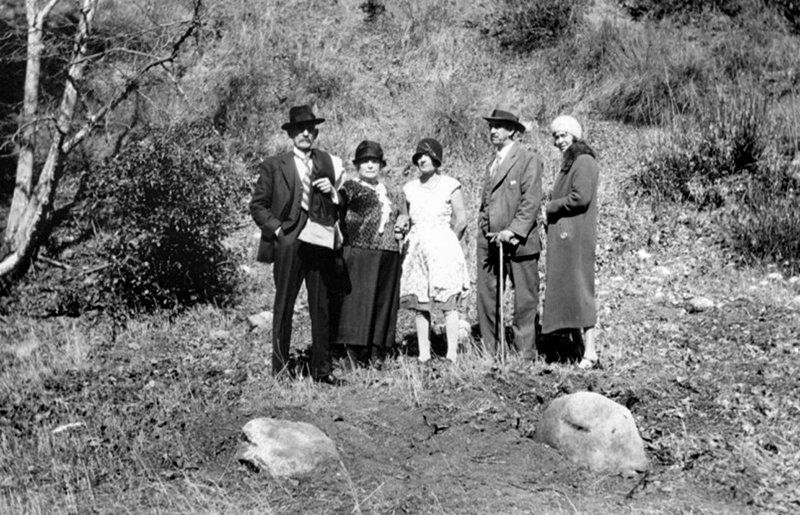 Before her death she took several members of her family to Placeritos Canyon and pointed out to them the exact spot where the chapel had been erected and gold discovered by her ancestor. In this party were the Señoras Frances Lopez de Belderrain, and Graciosa Lopez de Wilson of San Fernando and these kind ladies have in turn shown the writer the self-same spot of FIRST GOLD DISCOVERY IN CALIFORNIA." Read Rivera's entire story and see the Walker brochure here. Whatever the truth of the dream legend or the accuracy of the tree's identification, Lopez and his partners did extract gold from Placerita Canyon in 1842 and did file a claim with the Mexican governor of Alta California — and that piece of parchment, with the governor's seal of approval, is what makes the Lopez discovery the first documented discovery of gold in California. Earlier discoveries in the Castaic and Piru region appear in 19th-century literature, but in each case, the documentary evidence is lacking. In a joint effort of fraternal organizations — Ramona Parlor No. 109 of the Native Sons of the Golden West, the La Mesa Club and the Kiwanis Club of Newhall-Saugus — a plaque was placed on March 9, 1930, the 88th anniversary of the Lopez discovery, at the site of the tree that is now recognized by the state of California as the Oak of the Golden Dream. GS2013: 19200 dpi jpeg from 300 dpi jpeg.